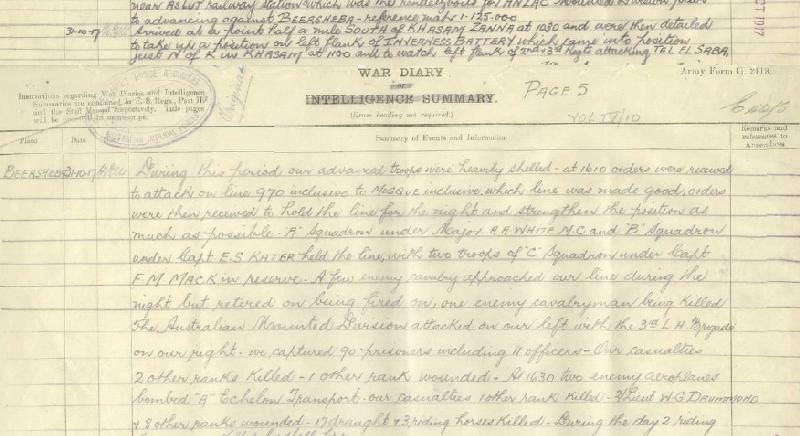 War Diary account of the 1st LHR, AIF. 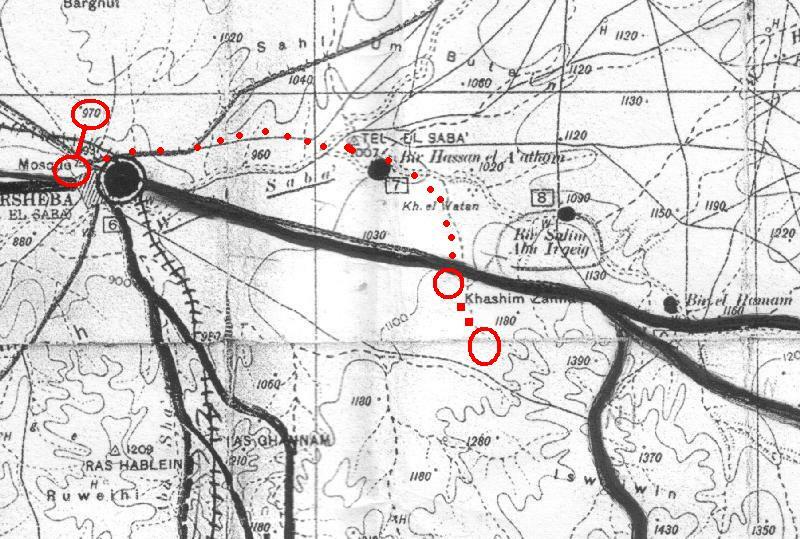 Arrived at a point half a mile south of Khasam Zanna at 1030 and were then detailed to take up a position on left flank of Inverness Battery which came into position just North of "K" in Khasam at 1100 and to watch left flank of 2nd and 3rd Regiments attacking Tel el Saba. During this period our advanced troops were heavily shelled. At 1610 orders were received to attack on line 970 inclusive to Mosque inclusive which line was made good, orders were then received to hold the line for the night and strengthen the position as much as possible. "A" Squadron under Major A A White MC and "B" Squadron under Captain ES Kater held the line, with two troops of "C" Squadron under Captain FM Mack in Reserve. A few enemy cavalry approached our line during the night but retired on being fired on, one enemy cavalryman being killed. The Australian Mounted Division attacked on our left with the 3rd LH Brigade on our right, we captured 90 prisoners including 11 officers. Our casualties 2 Other Ranks killed - 1 other rank wounded. At 1630 two enemy aeroplanes bombed "A" Echelon Transport our casualties 1 Other Rank killed, Second Lieutenant WG Drummond and 8 Other Ranks wounded. 17 draught and 3 riding horses killed. During the day 2 riding horses were killed by shell fire.